Oh yeah, I got the blush without the case >__<, the Lancome staff was already apologize for it. Okay la, who care about the case when you see the pretty blush right in front of your eyes? XD HAHA. I can't complain! Rose Melba! Don't you think I got a really pretty color?? *W* Rose mix with peach tone, I like how they mix the color together in this palette. The blush has 4 colors on 1 palette. I give a number to the palette so you can see more easier when it comes to the swatches. No.2 is a rose pink shade, really sweet and soft. No.3 is a soft peach shade, it has a natural glow when applied individually. No.4 is a coral orange shade with a glitter/shimmer on it. Can be use for contouring. I seriously love this all the colors on this palette. ♔ PRICE :: 480.000 idr (almost got a shock when see the price, so expensive T__T ). I think I'll never get a blush with such expensive price, except If I'm getting RICH someday, Hahahaha *W*. I must work hard then! LOL. 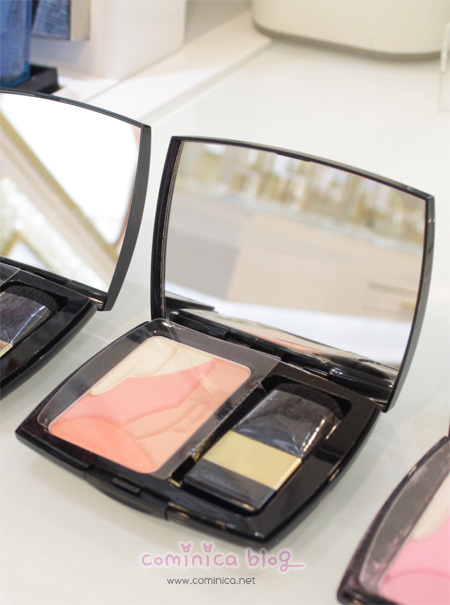 Have you tried this blush from Lancome? Do you interested in it? Btw. please support my facebook page for my upcoming clothing line HERE. Thank youuu so muchhhhhh~! I haven't tried any Lancome blushes before. The next time I go shopping I must go check out these blushes. I love the shades and the pinkiness of the blush! But YIKES expensive eh?